"It was just another day at the office for me." During the 1970s, George Lucas was busy conceptualizing ideas for two separate stories that he eventually hoped to bring to the silver screen. One was an epic space opera; the other was the tale of a rugged, adventuresome archaeologist. The science-fiction story ultimately appealed more to George, inspiring him to give birth to the Star Wars franchise while shelving the archaeologist idea. It was given new life, however, when he met with Steven Spielberg in the late '70s: Spielberg expressed a desire to direct a James Bond film, and Lucas assured him that he had a more enticing offer. When Spielberg heard Lucas' archaeologist concept he was immediately sold on the idea and agreed to direct the first Indiana Jones adventure, Raiders of the Lost Ark. One of the most important decisions in creating the film would lie in who would play the lead role. Spielberg's first choice was Harrison Ford, but Lucas was reluctant based on the fact that Ford had already been featured in two of his films. A number of other actors, including Peter Coyote, Tim Matheson, and Tom Selleck, were considered and screen tested. Selleck proved to have the right charm and charisma, yet he was bound by his Magnum P.I. contract, leaving the Raiders production back at square one. Ford's name came up again, and he was eventually offered the role that turned him into a global icon. The other main actors included Karen Allen as the feisty Marion Ravenwood, and John Rhys-Davies, who was second choice to Danny DeVito for the role of Sallah. With this group of talented actors, a story by George Lucas and Philip Kaufman, a screenplay by Lawrence Kasdan, and direction by Steven Spielberg, the production seemed blessed with the perfect creative team. Unsurprisingly, the film was an enormous success and quickly became one of the biggest blockbusters in cinema history. When they first discussed the idea for Indiana Jones, Lucas told Spielberg that if he agreed to direct Raiders of the Lost Ark, he would have to agree to direct two sequels, since he had envisioned the idea as a trilogy. When it came time to plan the inevitable sequel to Raiders, they had to start from scratch. Fortunately, the original story for Raiders was filled with so much material, that many ideas were left over and eventually used in the second installment, Indiana Jones and the Temple of Doom. Lucas wanted this middle section of the trilogy to be very dark, much like the second picture in the Star Wars saga, The Empire Strikes Back. Spielberg had never handled this type of material before, and did not feel entirely comfortable with the subject matter, which contained a voodoo cult conducting human sacrifices. Many feel that the story was mishandled by the time the final product hit the silver screen, complaining that the film was too childish for adults and too violent for children. Based on its intense violence, Temple of Doom was the primary film that inspired the now widely used PG-13 rating code. Regardless of its subject matter, however, Temple of Doom was another box office smash and proved to be as successful as Raiders. In planning the third installment of the trilogy, Indiana Jones and The Last Crusade, Lucas and Spielberg found themselves in a nice creative groove. Though Spielberg initially declined Lucas' idea to involve the Holy Grail, Lucas eventually won Spielberg over by creating a strong story, which included a fantastic introduction involving a Jones' boyhood. It was then Spielberg's idea to explore Indiana's roots, and he decided to revolve the film around Indy's relationship with his father, Professor Henry Jones Sr. (Sean Connery). The quest for the grail and the family bond worked together to create the strong underlying theme of faith and devotion seen in The Last Crusade. Though the production proved to be a challenge for both the cast and crew, their experiences on the other two films helped to keep them on the right creative path. When The Last Crusade was released in 1989, it quickly became yet another huge success. The Indiana Jones films have become undeniable classics and are often heralded as the best adventure films of all time. It is rare to think of the genre without also envisioning the heroic character, wearing his signature fedora hat and cracking his bullwhip. While I feel that the films are far from perfect, they inspire a sense of awe and wonder that fully reminds me just why I love the cinema. Meticulous care has gone into restoring these films for DVD, and the results are superb. 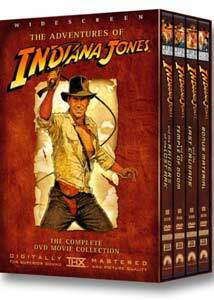 The fourth disc of the boxed set, dedicated to bonus materials, draws fans deeper into the Indiana Jones universe, offering a wealth of fascinating information about the production for all three films in the trilogy. While I have several reservations about the rumored Indiana Jones IV, I am certain that with this talented group of filmmakers at the wheel, it will prove to be a wildly enjoyable ride. Image Transfer Review: Though the image quality of the bonus materials varies, the effort that has gone into ensuring an overall pleasant visual presentation is impressive. The quality of the footage far exceeds the usual rush job seen on most documentaries. While the archival footage is raw and blemished by film artifacts, it is free from distracting video deficiencies. The interview segments are clean and clear and boast commendable color saturation. All of the varying source materials are as visually pleasing as possible. Audio Transfer Review: Presented in Dolby 2.0 Stereo surround, all of the supplements are clear and distortion free. Dialogue possesses a warm, natural characteristic and is always intelligible. Not much more can be said about this simple soundtrack, other than it is a more than adequate sonic experience for documentary-based material. Extras Review: Though the decision to not offer each film in the Indiana Jones Trilogy separately is disappointing, one can not go wrong with this boxed set, which features all three films with spiffed up transfers, as well as this fourth disc dedicated entirely to bonus materials. The classy packaging gives each disc its own Amaray case, all four of which are housed inside a collector's keep box. The bonus disc begins with Indiana Jones: Making the Trilogy, a lengthy documentary divided into three sections covering each of the three films. I was truly worried that this would merely be two hours of monotonous self-congratulating, but found myself pleasantly surprised with the abundance of fascinating information. The entire documentary is a carefully edited blend of recent interviews and candid behind-the-scenes footage. Several standouts include the original screen test with Tim Matheson and Karen Allen, a screen test with Tom Selleck and Sean Young, Alfred Molina reminiscing about having his body covered with tarantulas, and the reveal of a secret engraving on a pillar in the Well of Souls. An initial gripe I had with the bonus materials disc was the omission of storyboards and conceptual drawings, but I was happy to find a wealth of them featured within this documentary. The storyboards in particular are quite interesting, as it is apparent how heavily they influence the final shots in the film. While it would have also been nice to see several of the deleted scenes mentioned in the documentary, Making the Trilogy offers a firsthand account of what it was like to create the Indiana Jones films. Even at its extensive running time I never found it to be dull or tedious. Next, are four featurettes dedicated to the sights, sounds, and stunts of the Indiana Jones films. This brief featurette has been created in the same vein as the documentary, combining interview material with behind-the-scenes footage. With all of the hundreds of stunts in these three films, I found it somewhat absurd that they dedicate only ten minutes worth of time to this important element. Nevertheless, it is an enjoyable featurette that reveals the impressive work that went into creating the stunts without giving away too much of the magic. Legendary sound designer Ben Burtt guides us through this terrific featurette, which is all about explosions, gunshots, bullwhip cracks, body blows, punches, darts, critter noises, and cheese casserole (yes, cheese casserole). Burtt describes each of the creative and unique methods used to generate the various sound effects, followed by comparative scenes from the films. Sound design is something I have great interest in, so I thoroughly enjoyed this brief yet entertaining featurette. I have always believed that music is a crucial element of the movie-going experience, and I feel that goes double for the Indiana Jones films. Who can reminisce about these pictures without also thinking of the catchy theme song? Master composer John Williams guides us through this wonderful featurette, which focuses on the inspiration for the musical themes of each film in the trilogy. Before there was CGI, special effects often consisted of matte paintings, models, and dummies. The Light and Magic of Indiana Jones offers a glimpse at the hard work that went into creating the many impressive effects in the trilogy. It is interesting to see the original animatics for the ark opening sequence, and I enjoyed seeing how they made Toht's face melt and Belloq's head blow up, the latter initially earning Raiders an R rating. Portions of this revealing featurette do undermine a bit of the magic, however; I will never look at the mine car chase sequence the same way ever again. The trailer section features four theatrical trailers in addition to teaser trailers for both Raiders of the Lost Ark and The Last Crusade. Disappointing is the omission of the Temple of Doom teaser, which appeared on the first video release of Raiders of the Lost Ark. Otherwise, the trailers are a wonderful piece of nostalgia. The film elements have apparently gone through little to no restoration, allowing the trailers to appear exactly as I remember them in my youth. Also included is a brief trailer for the Indiana Jones based video game, The Emperor's Tomb. After an excruciatingly long wait, adventure fans finally have the Indiana Jones films on DVD. The burning question is�was it worth the wait? I believe so. While I desired a bit more from the special features, each film boasts remarkable audio and video transfers that exceeded my high expectations.